Sainsbury's, the UK's third-largest grocer, has been approached by a Middle Eastern investment fund about a possible takeover worth some £12bn. Qatar-based investment firm Delta Two is to table a written takeover proposal at 610 pence a share on Wednesday, BBC business editor Robert Peston said. Delta Two already owns a 24% stake in the supermarket firm and has been long considered as a potential suitor. 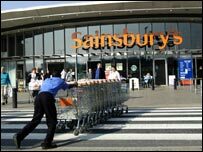 Sainsbury's rejected an approach from private equity firm CVC this year. Sainsbury's said that the latest approach "may or may not lead to an offer being made". It added that the board would make a further announcement "as appropriate". Sainsbury's shares added 9 pence, or 1.5%, to 594.5 in London. The BBC's business editor said the price offered represented a big premium. "It would be very hard to Sainsbury's board to tell Delta Two to hop off," he explained. "This feels to me like the final instalment in the soap opera of Sainsbury's takeover talks." The Financial Times said that Sainsbury's management, headed by chief executive Justin King, was willing to discuss the Delta Two offer. However, it added that the Sainsbury family, which controls about 18% of the firm's shares, was lukewarm about the proposal. A number of industry analysts said that the size of the deal could tempt the Sainsbury family to sell and that the Qatari fund could well be willing to sweeten its offer even more.